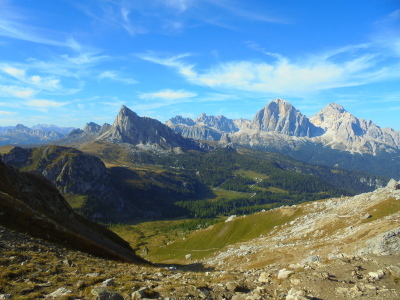 The Fiorentina Valley is crossed by the famous Alta Via n.1, excursion trail of the Dolomites. It is a long-distance excursion, which can be divided in some daily stages, with starting point Lake Braies. Each stage includes refuges and fixed refuge camps that offer comfort in the rest areas. The entire itinerary requires 10-15 days of walk with arrival in Belluno. The stage crossing the territory of Selva di Cadore is the 5th one and leads the hikers from Rifugio Nuvolau to Rifugio Città di Fiume. This part of the Alta Via crosses the Dolomitic Number 1 system (Croda da Lago – Mount Pelmo), recognised UNESCO World Heritage. From Rifugio Nuvolau (2,575 m) the trail descends to Passo Giau (2,236 m) and continues towards Forcella Giau (2,360 m). From here, the itinerary crosses the plain of Mondeval de Sora and Forcella Ambrizzola (2,277m) until Rifugio Città di Fiume (1,918m).